Reference input provides for "clean" switching in the vertical interval (line 6 for 625 and line 10 for 525). Each output can be configured as re-clocked or non re-clocked. In re-clocked mode the module will auto-detect standard video bit rates (143, 177, 270, 360 and 540Mbits/s) and transparently pass data from 10Mbits.s to 640Mbits/s when set to non re-clocked mode. ASI / DVB signals pass transparently in non re clocked mode. Microprocessor control and on board flash ram enable configurations and settings to be stored within the module (through power cycles and module removal). Local control capability is provided via the integrated dip switch and multifunction switch. Remote control, status monitoring and error reporting is possible when using the LYNX control system. 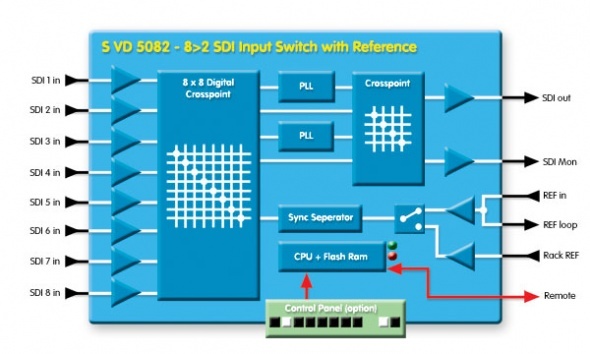 Clocked or non re-clocked SDI outputs. Input presence detection for all inputs. Auto detect video bit rates of 143,177,270,360,540Mbits/s. Transparently pass data between 10 and 640Mbits/s in non re-clocked mode. Synchronous switching (line 6 for 625, line 10 for 525). Selectable automatic switching to next available input if input signal is lost. Cyclic auto switching between available inputs (inputs and time duration configured from LYNX control system). Microprocessor controlled with internal flash ram for storing configuration. Full SNMP support when used with master controller option. Note. 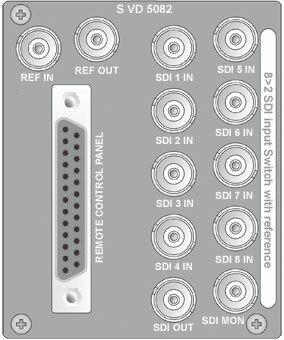 This modules rear connection panel takes up two rack card slots.